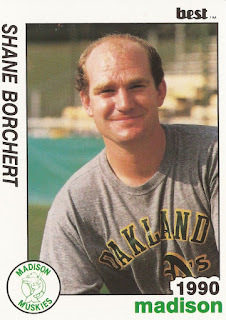 Shane Borchert started in Montana, he's apparently ended up in California and in between, he served as a trainer in minor league baseball. Borchert served as a trainer in the late-80s and early 90s in both the Giants and the Athletics systems. He appears to have since settled in the San Francisco Bay Area as a high school athletic trainer. A native of Kalispell, Mont., Borchert graduated from Western Montana College, where he majored in physical education, according to his Best card. He also served as trainer at the school in 1987 and 1988. He signed on with the Giants in 1989, serving as trainer at single-A Clinton. He moved to the Athletics for 1990, being the trainer at single-A Madison. He returned to Madison for 1991, then served as trainer at high-A Reno in 1992. Though a listing couldn't be found definitively linking the minor league trainer Shane Borchert to San Ramon, Ca., Borchert appears to have gone on to be the longtime trainer at California High School there. Borchert has had a sports medicine class there, he demonstrated concussion protocol in 2010 and, in 2016, he was inducted into the school's Hall of Fame as an athletic trainer.